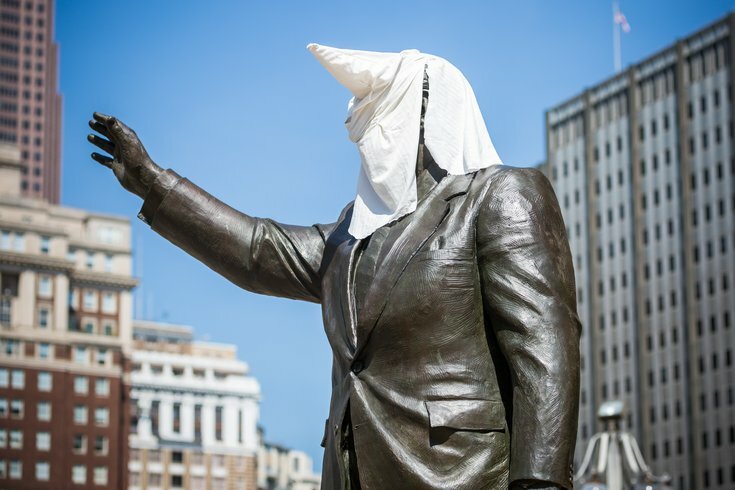 Black Lives Matter activists covered the head of the Frank Rizzo statue with a white hood on Friday, Aug. 12, 2016. The bronze statue stands in the plaza at the Municipal Services Building in Center City. What do you think should be done with the Frank Rizzo statue? Philadelphia wants to know. The city announced on Tuesday that it wants members of the public to share their ideas for the statue's prospective future. As Mayor Jim Kenney announced earlier this week, the statue's fate rests with a final decision from the city's Art Commission. But workers in several city departments will review any submissions they receive from the public, city officials said Thursday. "The purpose of this process is not to take an opinion poll on the statue’s current location, but to look for the best ideas from the public for the statute’s future," a press release stated. City officials said they will decide whether to remove the statue by late September. If it chooses to do so, Philly would initiate a policy introduced under former Mayor Michael Nutter for removing, relocating or deaccessioning public art. Kenney's administration would need to give the statue's artist 30 days' notice, and the Art Commission would still have to vote on the city's proposal in a public meeting, officials said. Anyone who wants to give their ideas can submit them here by 5 p.m. on Sept. 15. Ideas can also be mailed or given in person to the Office of Arts, Culture and the Creative Economy at City Hall. Talks over the statue's future heated up again after Councilwoman Helen Gym called for city officials to take the Rizzo statue down last week, in response to the recent violence in Charlottesville, Virginia. Rizzo had a distinguished career with the Philadelphia Police Department before serving as mayor from 1972-80. But opponents of the monument claim it symbolizes police discrimination and brutality against people of color and the LGBT community during the Rizzo era.